Vegan Eats and Treats! : Book Review & Giveaway: "Oh She Glows Everyday"
Book Review & Giveaway: "Oh She Glows Everyday"
*By the way, if you like cooking from apps, I really like the OSG app. It's got lots of recipes and Angela is always adding more. Also, I was stoked to see that the app is now available for Android phones too. I switched from Apple to Android, and now I can have it on my new phone too! a soup so full of veggies, it's practically a stew! I have loved pretty much every OSG soup recipe that I've tried, so I'm always interested in new soup recipes from Angela. 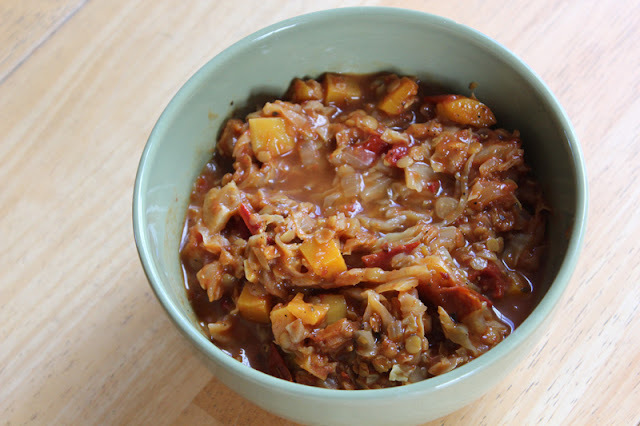 The first time I flipped through OSGED, this Metabolism-Revving Spicy Cabbage Soup caught my eye right away - especially because after all the rich and abundant eating of holiday times, I was attracted to such a light and nutritious soup. I really loved the flavors and textures and body of this soup and I've already made it twice. It's not really all that spicy, as much as well-spiced, flavorful, and light. As most soups do, this soup also got better and better with each passing day. This is a recipe I'm sure to make again and again. Mr. VE&T and I loved this 6 Vegetable and "Cheese" Soup! It's loaded with veggies like sweet potatoes, broccoli, and carrots; it's got a hearty dose of nutritional yeast, and the result is thick, chunky, rich, and satisfying. I took the picture before I put on the pepitas and croutons for topping (doh!). It's not the most photogenic soup - ha ha! - but don't let that deter you from making it. I promise, it's really good! colorful and nutritious and delicious! I think this Sweet Potato, Chickpea, and Spinach Coconut Curry is one of my favorite recipes so far from this book. As you can see it's full of veggies and chickpeas. What you can't see is that it's warm and warming and super hearty. It's also a great use for chickpeas if you've been cooking up chickpeas just for the aquafaba. I like having a good stash of homemade aquafaba and homecooked chickpeas in the freezer -- in case of culinary emergencies! 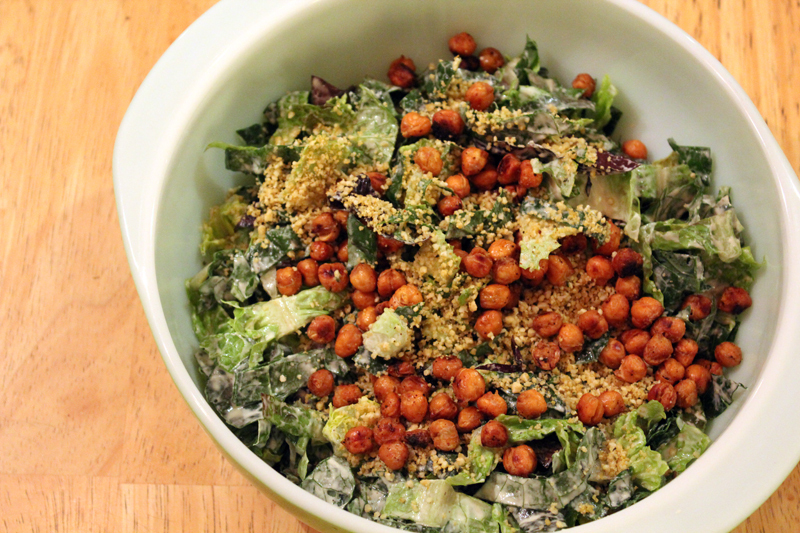 the Garlic-Roasted Chickpeas are an excellent spin on croutons, they're quick and easy to prepare and they provide a good umami blast, some chew, and some more protein to the salad. The Vegan Parmesan Cheese is also in the book and is quick to throw together and also adds a lot to the salad over all - increased depth of flavor and cheesiness. Just writing about this recipe makes me want to eat it again right now! giant piles of good stuff! 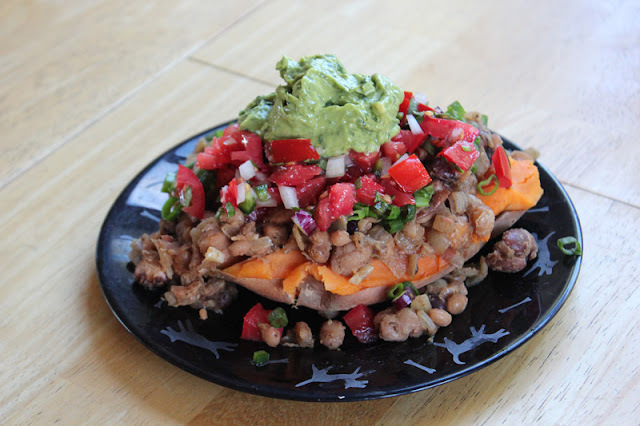 This recipe for Loaded Sweet Potatoes is pretty straightforward, but somehow it is also so goood! I don't make potato-y things very often, but I loved these baked sweet potatoes overflowing with beans and salsa and Avocado-Cilantro Crema. In fact, as you can see, I've made these twice and I've been dreaming about them ever since. I especially loved the idea of using sweet potatoes instead of regular potatoes - the sweetness goes so nicely with the salsa and the other toppings. Oh man, it doesn't happen often, but Mr VE&T and I disagreed on this one. I really really liked this dinner, and he didn't like it. What the heck!? Oh well, more for me! The All-Purpose Cheese Sauce in this Mac & Peas is great, with cashews, potatoes, carrots, nooch, a little coconut oil, and other goodies. It's thick and creamy and lovely. At least I thought so! Now I'll have to wait for Mr VE&T to have some other dinner plans so I can make this again. I'd also love to make the cheese sauce and put it to use as a dip or sauce with veggies, or on nachos! 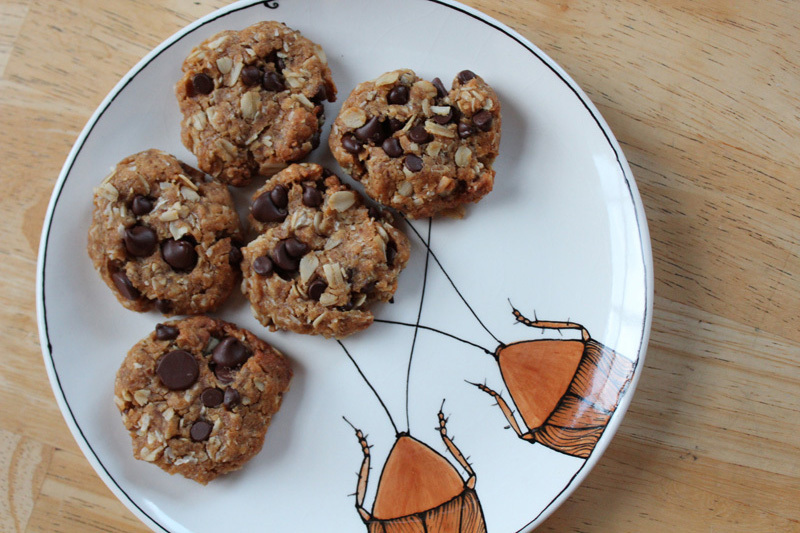 Oh wow, these Flourless Peanut Butter Cookies were so good! I love that this book has so many gluten-free treats. (In fact every recipe indicates up at the top of the page whether it's gluten-free, soy-free, nut-free, oil-free, etc ) These cookies have shredded coconut, chocolate chips, oats, maple syrup, and peanut butter! I made these for one of my yoga classes - and they were a big hit! I always like to make gf cookies for my students, just in case any of my students are gf. I also have lots of friends and loved ones who are gf and so I'm always on the look out for special treats I can make for them. Also, I must say, I haven't yet ever made a dud cookie from one of Angela's recipes. I think she has some real cookie skillz! 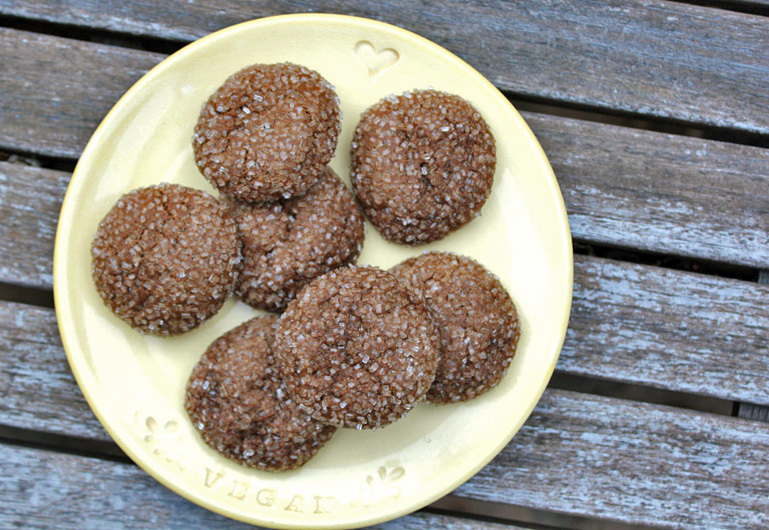 Speaking of excellent gluten-free cookies, I've already made these Chewy Molasses Spelt Cookies three times - they were just perfect for the holiday season and wintry treats! I love the amount of spices in this cookie and the crispy crackle of the outside paired with the chewy molasses-y insides. I also made these for my yoga students and they were happily devoured! 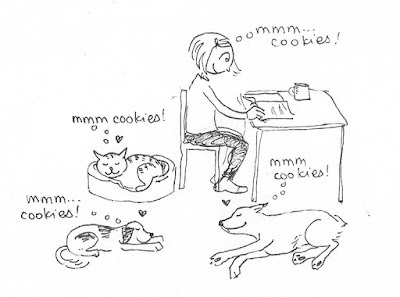 ours is a household full of cookie fans! True to her style, the recipes in OSGED are healthy without sacrificing flavor and tasty without being overly complex or requiring elaborate ingredients - both which I really appreciate. This book would be especially good for newer vegans, for someone who is interested in exploring vegan or plant-based food, or as a gift to get for family members who never know what to cook for you. I particularly love that there are hardly any unusual "specialty" ingredients, you won't need to go to two natural food stores, the mainstream store, and Trader Joe's to complete your shopping for any of these recipes. As I mentioned, I also have the first OSG cookbook and there are some similar recipes in both books, so there is a little bit of overlap. Several of the recipes in OSGED are quite simple: things like nut butters, coconut butter, chia pudding, two hummus recipes, guacamole, and avocado toast. I already know about these things, but I know there are a lot of folks out there who don't, and the book presents them really well and in clear and appealing way. And also, her recipes are consistently reliable: good, clear, easy to follow, easy to prepare. I really appreciate that about her recipes so much. I can't remember ever making a recipe from OSG and not having it come out the way I expected it to, which is really saying something. This book presents a good balance of simple and quick recipes along with more complex flavors and recipes. Aesthetically, the book is fantastic: every single recipe has a beautiful full-page color picture, the font is clean and lovely and easy to read, the ingredients are laid out clearly and in order of use, every recipe indicates if it's soy-free/gluten-free/oil-free/kid-friendly/etc, and prep time and cooking time estimate are provided. 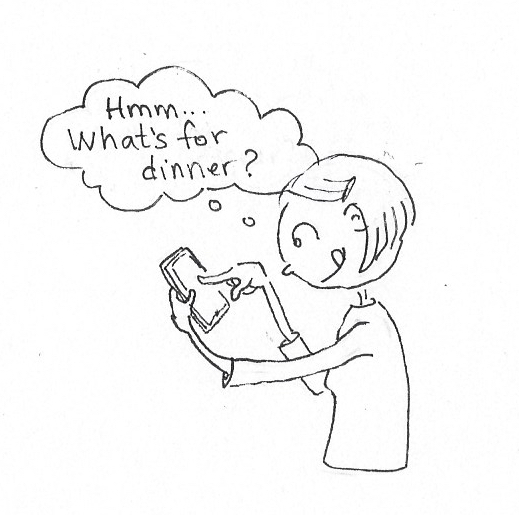 It's a pleasant and effortless user experience! 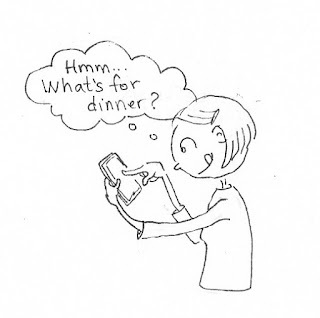 As for me, I especially love the entrees, soups and salads, and the desserts! 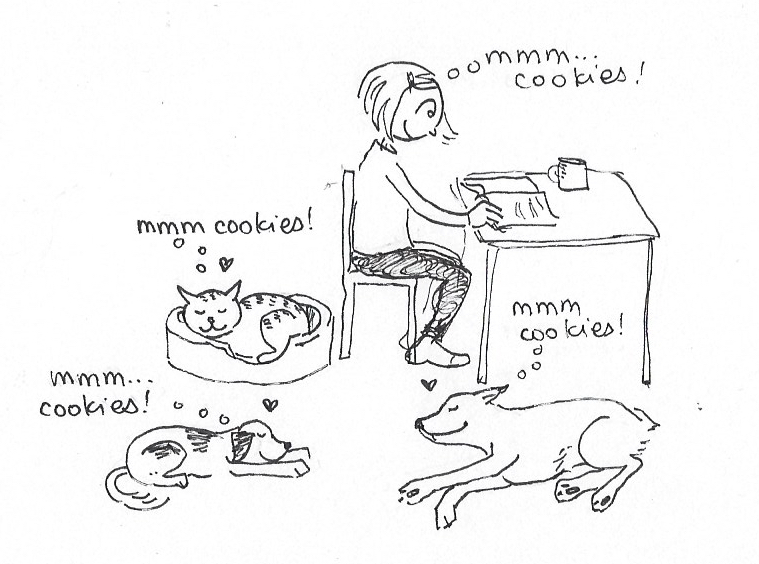 Plus, I mean really, a whole cookie chapter? I am, after all, the gal that made 13 kinds of cookies for my own wedding instead of a cake! The publishers at Avery Press sent me my copy of the book to review, and are are allowing me to offer a giveaway to this beautiful book to one lucky reader in the USA. To enter, please leave me a comment and tell me which recipes sound good to you, or what you ate for lunch today, or just about anything will do! And please leave your email or make sure I can get a hold of you or I will just pick a different winner! Good luck! I want to try the Mac & Peas recipe to see if I fall into the Amey or Mr. V&ET camp! But seriously, they all look good and I would love to get familiar with Angela's recipes. 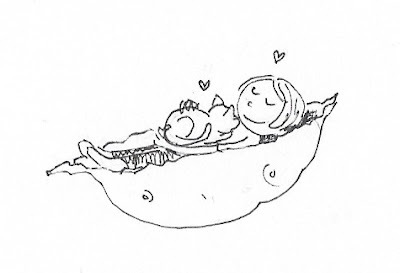 I think I have made some things from her blog but have never looked at her books or app. 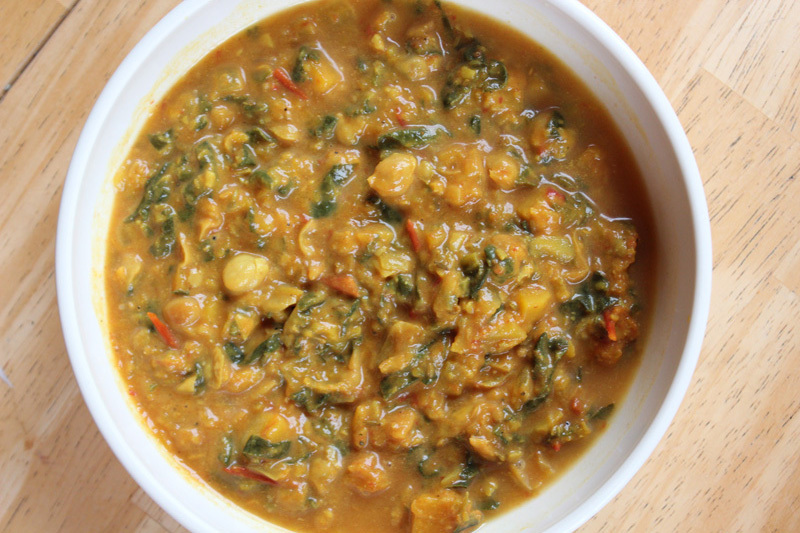 I think the sweet potato, spinach and chickpea coconut curry looks and sounds delicious! I love the recipes from Oh She Glows too and would love to try this cookbook! 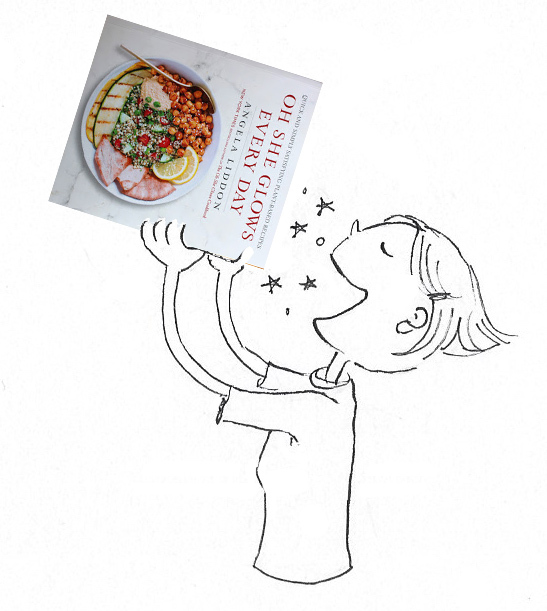 I would love love love this cookbook! 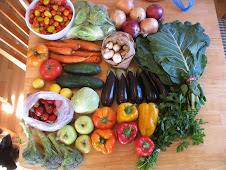 OSG is one of my favorite blogs - she always has great recipes. 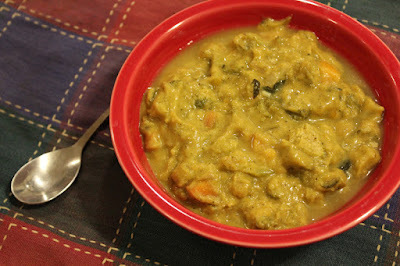 The sweet potato, chickpea spinach coconut curry looks awesome - I'd probably try that first! I'd love to try the ceasar salad!! The Thai Crunch Salad sounds wonderful! I really enjoy trying new salad recipes, yum! 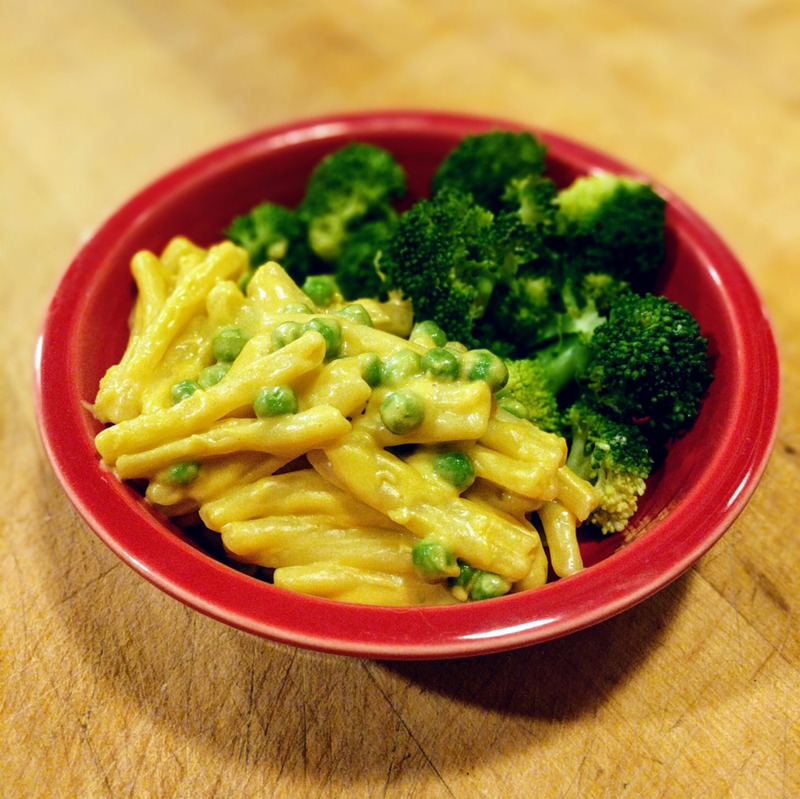 I made Amy's vegan boxed mac and cheese, and added frozen peas, just yesterday for lunch! I'd love to make this OSG homemade version. we must have similar tastes...i made those two soups first also! and am in love with every single other recipe i've tried from the book, especially the caesar salad and the thai crunch salad. i really want to try those PB cookies now...they look incredible. i ate hummus and veggies!! The loaded sweet potatoes look amazing! I'm a cookie lover through and through so both of those you mentioned appeal! The chili cheese nachos sound perfect for Super Bowl Sunday. The cabbage soup looks perfect! I'd also like to try the ginger cookies. I think I would love some of that cabbage soup goodness with the salad and then a stuffed potato and please more avocado on that. Oh and please pass the cookies. And Yes. I did not eat lunch today !!! All her cookie recipes on her website have been winners, but I definitely need more cookie recipes to try out! i love OSG, thanks for the great giveaway! for lunch today I had a sweet potato, tofu and brussels sprouts hash with avocado. it was left over from last night & even better today. i'd love to try the (divisive) cheese sauce, i'm always on the hunt for that perfect vegan sauce. yum! i had a chickpea salad today! The flourless Peanut Butter Cookies and the Sweet Potato, Chickpea, and Spinach Coconut Curry look so good!!! I am down with the cookie recipes. 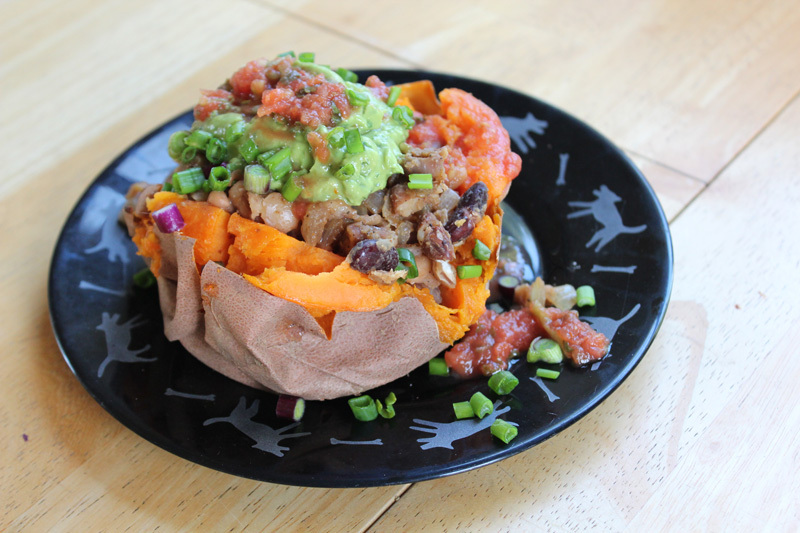 Also, the baked sweet potatoes look rockin' I have loved sweet potatoes with Mexican food for a long time. I want to try every single recipe that you talked about. Looks like another great cookbook by Angela. I cook out of her first one pretty regularly. Lsc803@gmail.com. 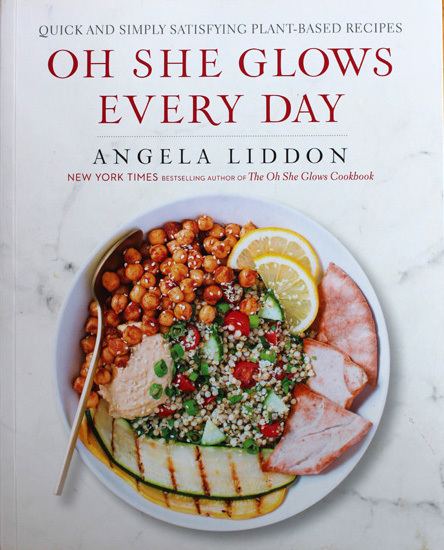 I love Oh she Glows...My daughter has it and I use it often to make dinners...I would love to try the soup of vegies that is almost a stew...That sounds soooo good. And the Crowd Pleasing Cesar Salad too. I hope I'm a winner so my dinners will be too. those peanut butter cookies look divine! I'm new the vegan lifestyle, but am loving what I've learned to prepare so far. 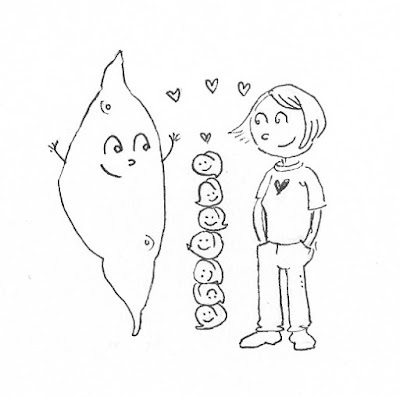 I learned about the Oh She Glows book from Vegan Crunk, which is a blog I have come to love. You had me at "cheese soup." Oh I loooooove OhSheGlows. Her blog was the very first I started to follow - back before she was uber famous ;) I was in my car once driving and saw her run by my car and I got SUPER excited. She's like a celebrity to me haha. And I'm kind of dorky. I love the crowd pleasing caesar salad! It is so good! I make it almost every holiday season!